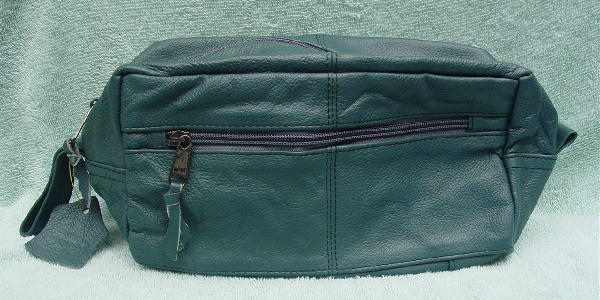 This genuine leather dark teal green color toiletry bag has a top side to side zipper with a leather pull and a left side 7 1/2" by 3" wide finger carry strap. The front side has a 7 1/2" wide zipper and a 9" wide by 3 1/4" deep section. The main center section has a back open pocket. The lining is in a black plastic. It doesn't look like it has been used. It's from an Italian male model.